INFLATION: The annual rate of inflation, based on monthly WPI, stood at 2.84% (provisional) for the month of January, 2018 (over January, 2017) as compared to 3.58% (provisional) for the previous month and 4.26% during the corresponding month of the previous year. Build up inflation rate in the financial year so far was 2.30% compared to a build up rate of 4.55% in the corresponding period of the previous year. 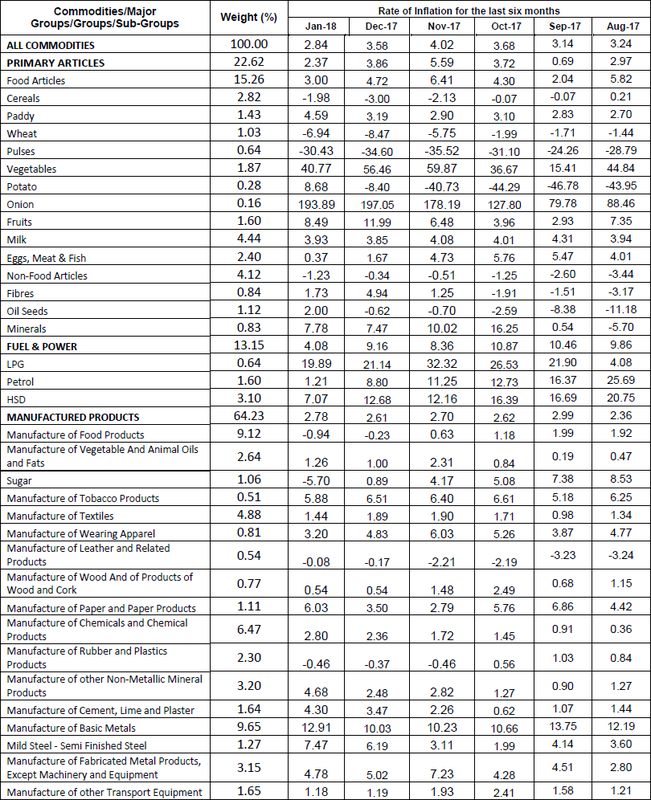 The index for ‘Food Articles’ group declined by 2.4 percent to 140.6 (provisional) from 144.1 (provisional) for the previous month due to lower price of gram and fruits & vegetables (10% each), urad and ragi (5% each), masur, rajma and jowar (3% each), bajra (2%) and maize, barley, poultry chicken and peas/chawali (1% each). However, the price of betel leaves (4%), fish-inland, egg, condiments & spices and arhar (2% each) and moong, paddy, fish-marine, sugarcane and wheat (1% each) moved up. The index for ‘Non-Food Articles’ group rose by 1.4 percent to 120.7 (provisional) from 119.0 (provisional) for the previous month due to higher price of raw wool (15%), guar seed (10%), soyabean (9%), raw silk and hides (raw) (6% each), safflower (kardi seed) (4%), raw jute, gingelly seed, raw cotton and copra (coconut) (3% each) and coir fibre (1%). However, the price of castor seed and mesta (5% each), raw rubber and floriculture (3% each) and linseed, niger seed and cotton seed (1% each) declined. The index for ‘Minerals’ group declined by 0.3 percent to 121.9 (provisional) from 122.3 (provisional) for the previous month due to lower price of manganese ore (15%) and chromite (7%). However, the price of sillimanite (10%), iron ore (3%), lead concentrate and zinc concentrate (2% each) and phosphorite (1%) moved up. The index for ‘Crude Petroleum & Natural Gas’ group rose by 0.3 percent to 78.3 (provisional) from 78.1 (provisional) for the previous month due to higher price of crude petroleum (1%). However, the price of natural gas (1%) declined. The index for ‘Coal’ group rose by 2.4 percent to 121.1 (provisional) from 118.3 (provisional) for the previous month due to higher price of non-coking coal (6%). However, the price of coking coal (3%) declined. The index for ‘Mineral Oils’ group rose by 1.4 percent to 88.2 (provisional) from 87.0 (provisional) for the previous month due to higher price of HSD(3%), kerosene (2%) and furnace oil, bitumen, petrol, naphtha and ATF (1% each). However, the price of petroleum coke (2%) and LPG (1%) declined. The index for ‘Electricity’ group declined by 3.5 percent to 102.4 (provisional) from 106.1 (provisional) for the previous month due to lower price of electricity (4%). The index for ‘Manufacture of Food Products’ group declined by 0.5 percent to 126.8 (provisional) from 127.4 (provisional) for the previous month due to lower price of molasses (26%), gram powder (besan) (7%), sugar and other meats, preserved/processed (3% each), processing & preserving of fish, crustaceans & molluscs & products thereof, manufacture of macaroni, noodles, couscous & similar farinaceous products, gur, chicken/duck, dressed-fresh/frozen, castor oil, bagasse, buffalo meat, fresh/frozen and groundnut oil (2% each) and rice bran oil, condensed milk, processed tea, ghee, powder milk, spices (including mixed spices), processing & preserving of fruit & vegetables, manufacture of processed ready to eat food, coffee powder with chicory, manufacture of prepared animal feeds and honey (1% each). However, the price of soyabean oil (5%), wheat bran (4%), rice products (3%), vanaspati, sunflower oil and salt (2% each) and cotton seed oil, manufacture of starches & starch products, manufacture of bakery products, copra oil, palm oil and sooji (rawa ) (1% each) moved up. The index for ‘Manufacture of Beverages’ group rose by 0.2 percent to 119.9 (provisional) from 119.7 (provisional) for the previous month due to higher price of wine (2%) and aerated drinks/soft drinks (incl. soft drink concentrates) (1%). However, the price of rectified spirit (2%) and bottled mineral water (1%) declined. The index for ‘Manufacture of Tobacco Products’ group declined by 0.5 percent to 151.3 (provisional) from 152.1 (provisional) for the previous month due to lower price of other tobacco products (4%). However, the price of cigarette (3%) and biri (2%) moved up. The index for ‘Manufacture of Wearing Apparel’ group declined by 0.3 percent to 138.5 (provisional) from 138.9 (provisional) for the previous month due to lower price of manufacture of knitted & crocheted apparel (1%). The index for ‘Manufacture of Leather and Related Products’ group rose by 0.3 percent to 120.7 (provisional) from 120.3 (provisional) for the previous month due to higher price of gloves of leather (2%) and leather shoe and waterproof footwear (1% each). However, the price of belt & other articles of leather (2%) and canvas shoes and chrome tanned leather (1% each) declined. The index for ‘Manufacture of Wood and of Products of Wood and Cork’ group rose by 0.4 percent to 130.8 (provisional) from 130.3 (provisional) for the previous month due to higher price of wooden block-compressed or not (7%), lamination wooden sheets/veneer sheets and wood cutting, processed/sized (2% each). However, the price of wooden box/crate and timber/wooden plank, sawn/resawn (2% each) declined. The index for ‘Manufacture of Paper and Paper Products’ group rose by 2.5 percent to 121.4 (provisional) from 118.4 (provisional) for the previous month due to higher price of corrugated sheet box (13%), tissue paper (11%), paper carton/box (3%), laminated paper and base paper (2% each) and hard board, map litho paper, pulp board, kraft paper and card board (1% each). However, the price of paper bag including craft paper bag (10%), corrugated paper board (4%) and newsprint (1%) declined. The index for ‘Printing and Reproduction of Recorded Media’ group rose by 0.6 percent to 144.6 (provisional) from 143.7 (provisional) for the previous month due to higher price of hologram (3d) (4%), printed labels/posters/calendars (2%) and printed books, newspaper and printed form & schedule (1% each). The index for ‘Manufacture of Chemicals and Chemical Products’ group rose by 0.9 percent to 113.8 (provisional) from 112.8 (provisional) for the previous month due to higher price of carbon black (12%), acetic acid and its derivatives and camphor (8% each), sulphuric acid and caustic soda (sodium hydroxide) (7% each), nitric acid, menthol and amine (6% each), ammonia liquid, ammonium sulphate and mono ethyl glycol (5% each), epoxy, liquid and toilet soap (4% each), catalysts, adhesive tape (non-medicinal) and xlpe compound (3% each), ammonia gas, creams & lotions for external application, ethyl acetate, ammonium nitrate, polyester film(metalized)and polyester chips or polyethylene terepthalate (pet) chips (2% each) and hydrogen peroxide, polyethylene, mixed fertilizer, phthalic anhydride, ethylene oxide, organic chemicals, other petrochemical intermediates, dye stuff/dyes incl. dye intermediates and pigments/colours, oleoresin, powder coating material, explosive, insecticide and pesticide, plasticizer, sodium silicate, organic solvent, other inorganic chemicals, soda ash/washing soda and poly vinyl chloride (pvc) (1% each). However, the price of tooth paste/tooth powder (5%), shampoo (4%) and detergent cake, washing soap cake/bar/powder, phosphoric acid, nitrogenous fertilizer, others, additive, rubber chemicals, gelatine, adhesive excluding gum, agro chemical formulation and paint (1% each) declined. The index for ‘Manufacture of Pharmaceuticals, Medicinal Chemical and Botanical Products’ group declined by 1.1 percent to 121.7 (provisional) from 123.1 (provisional) for the previous month due to lower price of anti-malarial drugs (9%), anti allergic drugs (5%), antibiotics & preparations thereof (4%), vials/ampoule, glass, empty or filled (3%), ayurvedic medicaments (2%) and api & formulations of vitamins (1%). However, the price of anti cancer drugs (4%), antidiabetic drug excluding insulin (i.e. tolbutam) (3%), simvastatin (2%) and antioxidants, antipyretic, analgesic, anti-inflammatory formulations and antiseptics and disinfectants (1% each) moved up. The index for ‘Manufacture of Rubber and Plastics Products’ group rose by 0.3 percent to 107.8 (provisional) from 107.5 (provisional) for the previous month due to higher price of 2/3 wheeler rubber tube (4%), polythene film, v belt, conveyer belt (fibre based), plastic furniture and rubberized dipped fabric (3% each), plastic tube (flexible/non-flexible), medium & heavy commercial vehicle tyre, pvc fittings & other accessories, rubber cloth/sheet and plastic tank (2% each) and plastic button, rubber crumb, plastic film, polyester film (non-metalized), rubber tread and rubber moulded goods (1% each). However, the price of tooth brush (3%), 2/3 wheeler tyre, processed rubber, rubber components & parts and tractor tyre (2% each) and polypropylene film, elastic webbing, plastic box/container, acrylic/plastic sheet, solid rubber tyres/wheels and plastic tape (1% each) declined. 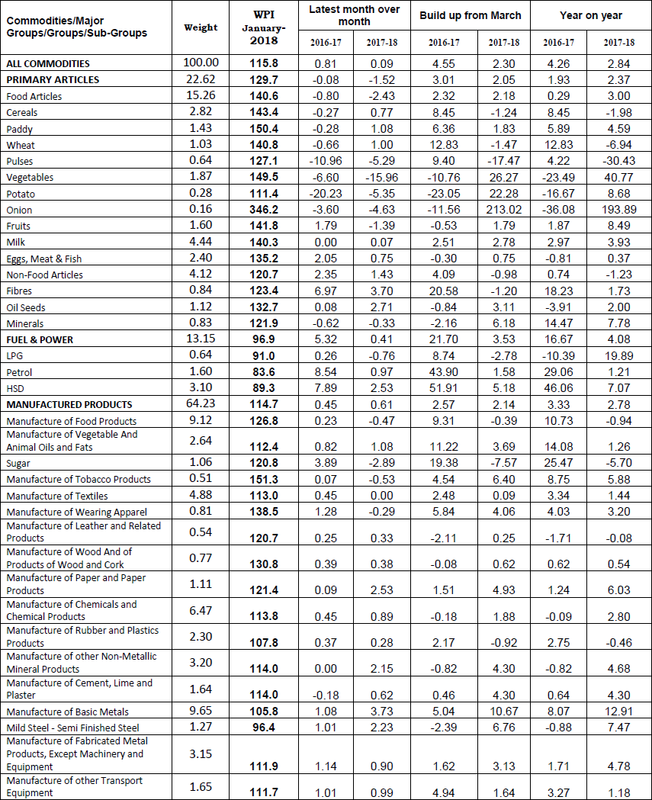 The index for ‘Manufacture of other Non-Metallic Mineral Products’ group rose by 2.2 percent to 114.0 (provisional) from 111.6 (provisional) for the previous month due to higher price of graphite rod (44%), porcelain sanitary ware (5%), marble slab, asbestos corrugated sheet and fibre glass incl. sheet (2% each) and cement superfine, granite, railway sleeper, clinker, ordinary portland cement and lime & calcium carbonate (1% each). However, the price of cement blocks (concrete) (6%), ordinary sheet glass (3%), ceramic tiles (vitrified tiles) (2%) and non ceramic tiles, poles & posts of concrete, stone, chip and plain bricks (1% each) declined. The index for ‘Manufacture of Basic Metals’ group rose by 3.7 percent to 105.8 (provisional) from 102.0 (provisional) for the previous month due to higher price of MS bright bars (21%), sponge iron/direct reduced iron (DRI) (11%), angles, channels, sections, steel (coated/not) (10%), alloy steel wire rods (8%), MS pencil ingots (6%), hot rolled (HR) coils & sheets, including narrow strip and cold rolled (CR) coils & sheets, including narrow strip (5% each), gp/gc sheet, MS wire rods and mild steel (MS) blooms (4% each), zinc metal/zinc blocks, pig iron and aluminium ingot (3% each), silicomanganese, stainless steel tubes, aluminium alloys, ferrosilicon, stainless steel bars & rods, including flats and aluminium shapes-bars/rods/flats (2% each) and copper metal/copper rings, ferromanganese, brass metal/sheet/coils, ferrochrome, galvanized iron pipes, MS castings and aluminium metal (1% each). However, the price of stainless steel coils, strips & sheets and alloy steel castings (1% each) declined. The index for ‘Manufacture of Fabricated Metal Products, Except Machinery and Equipment’ group rose by 0.9 percent to 111.9 (provisional) from 110.9 (provisional) for the previous month due to higher price of iron/steel hinges (5%), bolts, screws, nuts & nails of iron & steel and pressure cooker (4% each), stainless steel utensils (3%), forged steel rings, steel structures, steel container and metal cutting tools & accessories (2% each) and electrical stamping- laminated or otherwise, steel pipes, tubes & poles, hose pipes in set or otherwise and jigs & fixture (1% each). However, the price of sanitary fittings of iron & steel (15%) and lock/padlock and aluminium utensils (1% each) declined. The index for ‘Manufacture of Computer, Electronic and Optical Products’ group rose by 0.3 percent to 111.0 (provisional) from 110.7 (provisional) for the previous month due to higher price of scientific time keeping device (2%) and air conditioner, colour TV, watch and electronic printed circuit board (PCB)/micro circuit (1% each). However, the price of sunglasses (3%) and electro-diagnostic apparatus, used in medical, surgical, dental or veterinary sciences (2%) declined. The index for ‘Manufacture of Electrical Equipment’ group rose by 0.1 percent to 110.1 (provisional) from 110.0 (provisional) for the previous month due to higher price of jelly filled cables (9%), solenoid valve (8%), pvc insulated cable, rotor/magneto rotor assembly, AC motor, aluminium/alloy conductor and fan (2% each) and meter panel, copper wire, flourescent tube, electric & other meters, generators & alternators, incandescent lamps, electric accumulators and batteries (1% each). However, the price of rubber insulated cables (7%), light fitting accessories (5%), insulator (2%) and ACSR conductors, electric welding machine, insulating & flexible wire, electric switch gear control/starter, electric wires & cables and aluminium wire (1% each) declined. The index for ‘Manufacture of Machinery and Equipment’ group declined by 1.0 percent to 108.1 (provisional) from 109.2 (provisional) for the previous month due to lower price of agricultural tractors (13%), conveyors-non-roller type and pressure vessel & tank for fermentation & other food processing (6% each), separator (5%) and machinery used in the milling industry, chillers, gasket kit, hydraulic equipment, furnaces & ovens, excavator and sugar machinery (1% each). However, the price of cranes (13%), road roller (3%), open end spinning machinery, agriculture implements, pneumatic tools, pump sets without motor and pharmaceutical machinery (2% each) and precision machinery equipment/form tools, motor starter, rice mill machinery, roller & ball bearings, manufacture of bearings, gears, gearing & driving elements, air filters, mixing machine, printing machinery and mining, quarrying & metallurgical machinery/parts (1% each) moved up. The index for ‘Manufacture of Motor Vehicles, Trailers and Semi-Trailers’ group rose by 0.4 percent to 110.7 (provisional) from 110.3 (provisional) for the previous month due to higher price of seat for motor vehicles (14%), head lamp (2%) and cylinder liners, wheels/wheels & parts, filter element, radiators & coolers and chain (1% each). However, the price of brake pad/brake liner/brake block/brake rubber, others (4%), crankshaft and shafts of all kinds (2% each) and engine (1%) declined. The index for ‘Manufacture of other Transport Equipment’ group rose by 1.0 percent to 111.7 (provisional) from 110.6 (provisional) for the previous month due to higher price of motor cycles, propellers & blades of boats/ships and tanker (1% each). The index for ‘Manufacture of Furniture’ group rose by 0.5 percent to 120.7 (provisional) from 120.1 (provisional) for the previous month due to higher price of wooden furniture (3%), plastic fixtures (2%) and iron/steel furniture and steel shutter gate (1% each). However, the price of foam and rubber mattress (5%) declined. The index for ‘Other Manufacturing’ group declined by 6.7 percent to 104.2 (provisional) from 111.7 (provisional) for the previous month due to lower price of gold & gold ornaments (7%). However, the price of stringed musical instruments (incl. santoor, guitars, etc.) (4%) and playing cards (1%) moved up. The rate of inflation based on WPI Food Index consisting of ‘Food Articles’ from Primary Articles group and ‘Food Product’ from Manufactured Products group decreased from 2.91% in December, 2017 to 1.65% in January, 2018. For the month of November, 2017, the final Wholesale Price Index for ‘All Commodities’ (Base: 2011-12=100) stood at 116.4 as compared to 116.3 (provisional) and annual rate of inflation based on final index stood at 4.02 percent as compared to 3.93 percent (provisional) respectively as reported on 14.12.2017.